The world’s largest tech conference has apparently learned a big lesson about gender equity. CES, the huge annual consumer-electronics show in Las Vegas, caught major flak from activists in late 2017 when it unveiled an all-male lineup of keynote speakers for the second year in a row. Although it later added two female keynoters , the gathering’s ‘boys’ club’ reputation remained intact. This year, four of the nine current keynoters are women. GenderAvenger, the activist group that raised a ruckus last year, recently sent CES organizers a congratulatory letter and awarded the show a ‘Gold Stamp of Approval’ for a roster of keynote and ‘featured’ speakers that it says is 45 percent women – 60 percent of them women of color. It’s a significant change for CES, which like most tech conferences remains disproportionately male, just like the industry it serves. Even absent the robot dogs, sci-fi worthy gadgets and ‘booth babes’ CES has been known for, you could readily peg it as a technology show from the bathroom lines alone – where men shift uncomfortably as they wait their turn while women waltz right in. 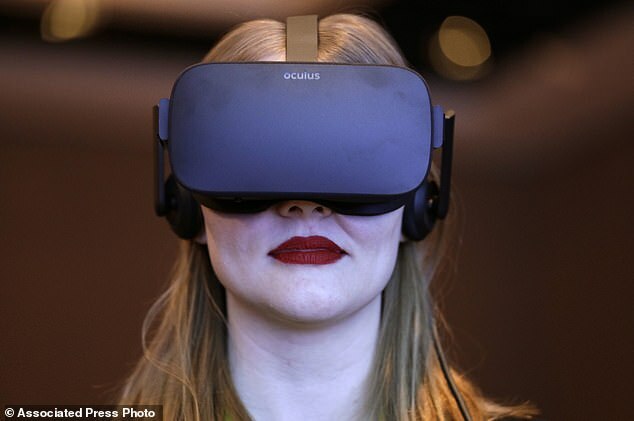 A woman participates in a virtual reality presentation during an Intel news conference before CES International in Las Vegas. CES, the huge annual consumer-electronics show in Las Vegas, caught major flak from activists in late 2017 when it unveiled an all-male lineup of keynote speakers for the second year in a row. Keynoters this year include IBM CEO Ginni Rometty; Lisa Su, CEO of chipmaker Advanced Micro Devices; and U.S. Transportation Security Elaine Chao. The entire featured speaker list is currently half female, although the exact percentage won’t be known until after the event. ‘There is no question we keep trying to do better,’ said Gary Shapiro, CEO of the Consumer Technology Association, which organizes CES. The robots, which appeared at last year’s CES, were originally created in 2012 by Mr Walker for a show called ‘Peepshow’. Mr Walker has previously hired out the robots for £2,500 ($3,100) at another technology industry event. They also performed at the Sexpo trade event in Melbourne in November 2016. ‘By placing the CCTV on the body of a pole dancer I am looking at the relationship of voyeurism and power,’ Mr Walker told AAP at the time. ‘Is she (the stripper) the one with the power, or is it the people watching her?’. ‘Diversity is about having people who see things differently – frankly, disagree with you and tell you that you are stupid,’ said Tania Yuki, CEO of social media analytics company Shareablee and an attendee of CES for the past several years. The big question, she says, is whether CES has really listened to its critics. CES is the place to be for tech companies and startups to show off their latest gadgets and features. More than 180,000 people are expected to attend this year, and some 4,500 companies will be on the convention floor. Among them are newcomers like Tide maker Procter & Gamble, defense contractor Raytheon and tractor seller John Deere – all eager to burnish their technology bona fides. But really leveling the playing field often means more than inviting female CEOs to speak. For starters, women and people of color are underrepresented in the tech industry, especially in leadership and technical roles. So, conference organizers might need to look harder, or be more flexible in who they invite to speak. While recent attendees say ‘booth babes’ – scantily clad women hawking gadgets – no longer seem to be a presence, some companies still hire ‘fitness models,’ largely young women wearing tight-fitting outfits, to demo products. This can make it difficult for the few women at the show who are there as executives, engineers and other technologists, as men mistake them for models, too. ‘When you are talking about scantily clad models you are setting a tone,’ said Bobbie Carlton, the founder of Innovation Women, a speaker bureau for women. A model performs at a display for Sony cameras after a Sony news conference at CES International in Las Vegas. Critics have been on the case of one of the tech industry’s largest trade shows for not including enough female speakers. Aureole’s wine angel rappels up the wind tower at the Mandalay Bay hotel and casino during CES International in Las Vegas. 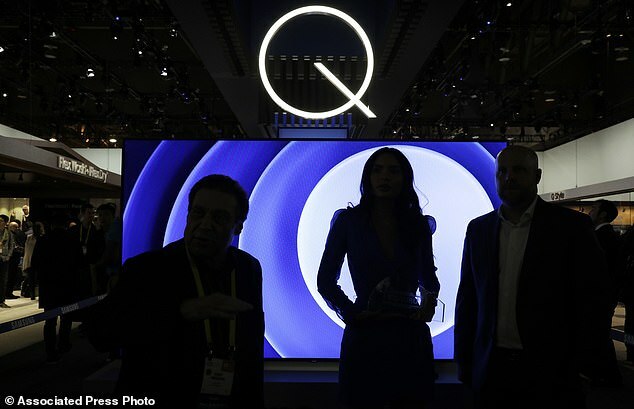 The weeklong event is one of the world’s largest trade shows and where many tech companies and startups go to show off their latest gadgets and more than 180,000 people are expected to attend CES this year. It is against this background that a growing number of people inside and out of the tech industry are urging organizers of events like CES to ensure that their roster of speakers features a broad array of people, diverse in gender, race as well as in their thinking. There are also logistical challenges, Carlton said. For example, women often work for smaller companies, which can find it more challenging to ‘send someone cross-country to stay at a fancy hotel for three days,’ she said. Rajia Abdelaziz is CEO of invisaWear, a startup that makes smart ‘safety jewelry.’ While she’s attending CES this year, she said it wasn’t worth the $10,000 it would cost her company to have its own convention-floor booth. In addition to the cost concerns, Abdelaziz notes that her products are primarily aimed at women – and there just aren’t that many of them at CES. Women are also still more likely to be responsible for the home and for child care, so they might turn down speaking opportunities if the timing doesn’t work for them, Carlton said. CES has tried to make some concessions. For example, it offers private pods for women to pump breast milk at the event. But it doesn’t offer child care support, unlike the smaller Grace Hopper Celebration for Women in Computing conference, a fall event aimed at women in computer science.